We provide our dogs with NuVet Plus supplements every day. These supplements come in a tasty chewable tablet that the dogs love and we feel they are the best supplements on the market today. Our dogs keep beautiful, shiny coats, strong clean teeth, sharp vision, and strong immune systems. We use high grade foods and use NuVet Plus to fill in the gaps. We strongly recommend the use of NuVet Plus for your puppy or dog. NuVet Plus is designed to combat free radicals and assist in providing your pet with the vitamins, minerals, herbs and antioxidants it needs to maintain a healthy lifestyle into old age. And the dogs love it! I have seen a huge differnce in our dogs skin and coat as well as in the care of their teeth. They seem to have less tarter build up and fresher breath. 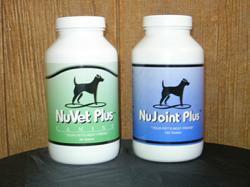 NuVet also helps in digestion and our dogs just seem happier and healthier all around. All of our puppies are started on Nuvet before they are born through the Dam carrying them. Once they are five weeks old they begin getting their own suppliment in chewable form. We reccomend keeping your new puppy on Nuvet throughout the coarse of their life. We will include a six day sample pack in our puppy pack just in case you have not gone ahead and ordered NuVet for the arrival of your new puppy.